As I looked at the staff flitting about serving customers at the Common Ground Café near Picton, it started to dawn on me that there was something very uncommon about the Common Ground Cafe. There was something about the simple Amish like farming clothes everyone wore. There was the quantity of pony tails that both men and women were sporting, and everyone seemed to have smooth glowing skin. [ADVERT]The menu was small and initially seemed fairly routine. It boasted flame grilled barramundi, BBQ chicken burgers, home made 'pioneer pies', wood fired pizzas and real fruit smoothies. But there were some obscure options that had me intrigued. What's a 'lemon mate'? I sat mesmerised as the waitress described the ingredients of the green mate tea: kale, broccoli, silver beet and the rare South American herb yerba. Wow, I knew then I wasn't in Gloria Jeans. Without getting bogged down in detail, the community of devotees that are behind the Common Ground Café and Bakery belong to an international confederation of religious communities called the Twelve Tribes. The Twelve Tribes refuse to align themselves with any denomination or movement as all denominations are 'fallen'. The groups philosophy is to "create a life of care and growth for the common good", hence the name. The community have their own 45 acre farm nearby where they grow their own organic produce. The café makes everything from scratch, from their own artisan breads and cakes to their pies soups and sandwiches. We order some of the pies on offer. The beef stroganoff is meaty and tasty, as is the pepper steak, but it's the accompanying cranberry and cashew nut salad that is a real stand out. We test their cake baking skills and are blown away by the serving size and flavours. Enormous slices of carrot cake, macadamia and caramel cheesecake and a blueberry and apple crumble impresses everyone at the table. 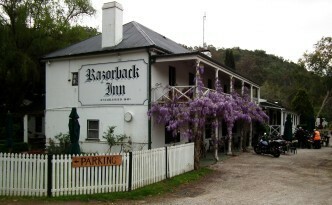 The Common Ground Cafe is situated near Picton at the historic 1849 Razorback Inn . It's a wonderful rural setting with its expansive parklike grounds. You can dine inside or outside in charming well tendered gardens. The group can also cater for large events in the adjoining 100 year old woolshed. Common Ground is a unique experience, worthy of a country excursion alone but you can easily combine it with a local 'country inn' tour calling into the Camden Valley Inn and the King George IV in Picton itself.